The month of Ramadan is an opportunity given by the gracious Creator for His servants to come close to Him, seek forgiveness for their sins, and fulfillment of their needs. In the Holy Qur’an, amidst an important discussion on the month of Ramadan, the following ayat (verse), which apparently has no direct connection with Ramadan, is included: And when my servants ask you about me, then surely I am near. I answer the prayer of the supplicant when he calls upon me, so respond to me, and believe in me, so that they may be led right. (2:186) Commentators agree that this is the most poignant of all the verses on the Divine-human connection. The whole verse is based on the singular first person pronoun, which is repeated seven (7) times. It is a confirmation of the close relationship between man and His creator, and an assurance that he will be listened to when he calls upon Him. That such a verse should be included among the ayats discussing the importance of Ramadan, and some of its rules (see 2:183-187), are an indication of the important role of Du’a in the month of Ramadan. Abstaining from fulfillment of physical desires stimulates an increase in spirituality, and creates an inclination for prayers and worship. Believers feel close to Allah, and Allah reminds them that He too is close, and will answer their prayers. The nights of Ramadan are spent in prayers and supplications. Even those believers, who normally do not have much time for prayers, try to do so during this month. This is because of the emphasis on the sanctity of the month, the promise of multiplied rewards, as well as the assurance of a favorable response. Says the Holy Prophet Muhammad (pbuh) . . . do supplicate with your hands raised . . . as these are the best of times, during which the Almighty looks at His servants with mercy, answers if they supplicate, responds if they call, grants if they ask, and accepts if they plead . . . (Prophet’s sermon welcoming the month of Ramadan). The best thing a believer can pray for during this month is forgiveness for his past sins. 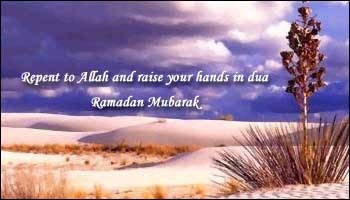 Many of the Du’as special to the month of Ramadan plead for forgiveness of the huge burden of sins which man carries. Ramadan is a glorious chance given to him to have his sins erased, and gain a higher position in the eyes of Allah. So many people are forgiven in this month that it is only the unfortunates who are deprived. Says the Prophet in the same sermon: Indeed, miserable is he who is deprived of Allah’s forgiveness in this great month. Other things to pray for include fulfillment of needs, removal of afflictions, and success in the hereafter.